On Saturday 26 September, a small number of BWGS satellite observers gathered at the house-boat of Leo Barhorst (Cospar 4253) at Almere. Present were, besides Leo Barhorst, BWGS president Bram Dorreman and me. A number of active BWGS observers alas could not come, hence the rather small group this time. 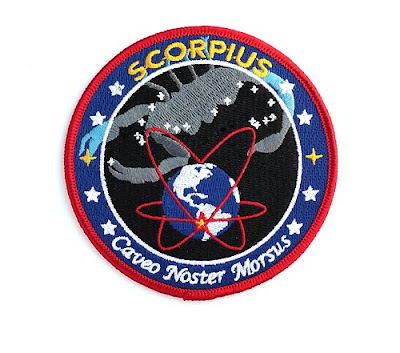 In the afternoon we exchanged some information, looked at some software, my collection of "black space program" mission, launch and unit patches, and Leo's collection of space-related postal stamps. I demonstrated how I astrometrically measure my satellite photographs for positions, and how I get brightness curves from an image. 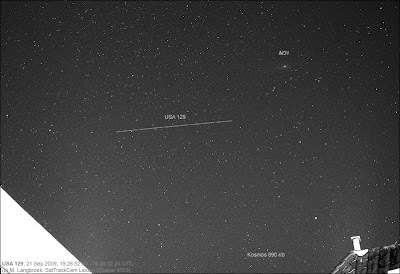 Immediately after that I rushed to re-aim the camera and capture the USA 144 decoy (99-028C) passing close to vega in the next minute. Predictions had put the track just west of Vega, and while Bram and Leo were watching there with binoculars I made a series of images. Strangely enough, Bram and leo did not pick it up: and the reason was, after a look at my photographs, that it passed east of Vega, not west! After a puzzled "huh?!?" it dawned upon me: the coordinates of my prediction software were still set on my Leiden locality! Next up were the objects related to the recent launch of a Russian Meteor weather satellite. Bram and Leo indeed picked one up with their binoculars. 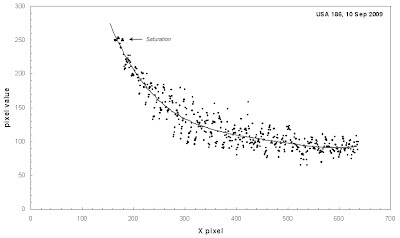 Note how quick the brightness drop is (it takes a mere 4 seconds) and how sharp the turnpoints in the diagram are. 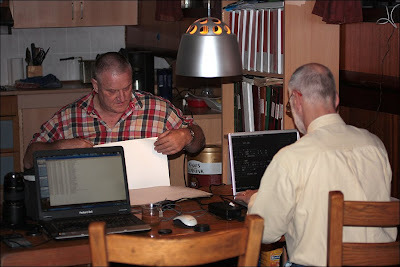 After this, Leo and Bram observed the NOSS 3-3 rocket, which is a flasher. As the sky quality rapidly deteriorated, we called it quits after that and went inside to reduce the observational data. It was nice to meet and observe together. Leo was a perfect host, and his cat Bankie kept my feet warm later that night. 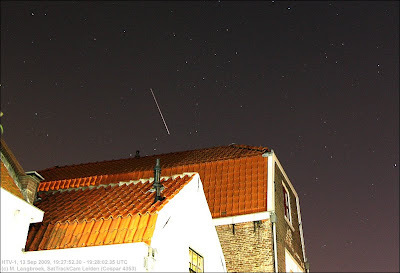 The past week saw several bright evenings, yielding a rich haul of satellite positions. Observations were done in the evenings of September 16, 17, 20 and 21. Data were obtained on some of "the usual suspects": the KH-12 Keyholes USA 129 and USA 186, the SAR Lacrosse 2, the HEO objects USA 184 and USA 198, and the USA 144 decoy. Both KH-12 Keyholes USA 129 and 186 slowly flared to -1 at September 16th: 96-072A at about 19:44:27 UTC in the southeast; 05-042A at 21:01:46 UTC in the northwest. USA 129 showed another bright slow flare peaking about 20:00:51 UTC on 17 Sep, just after the end of an exposure. I captured the rising part of it. 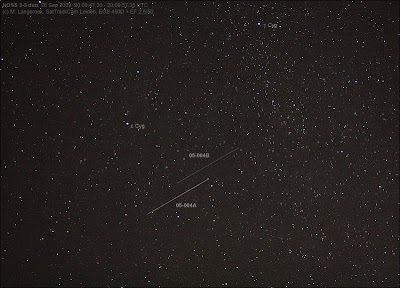 Below are two pictures of last evening (21 Sept), showing the KH-12 Keyhole plus a faint stray near M31, the Andromeda galaxy: and showing the USA 144 decoy passing close to the ELINT USA 184. The first image was made with the EF 50/2.5 macro lens, the second with the EF 100/2.8 macro USM lens. The globe with orbiting satellite, is a version of the NRO symbol. 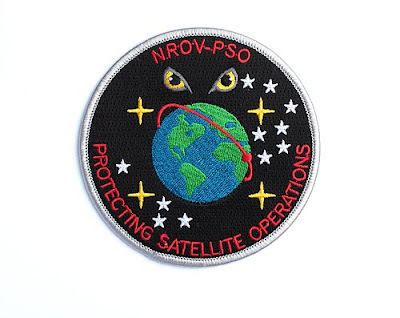 I had a communication about this patch with Trevor Paglen. Like me he feels it is probably from some security unit connected to the Vandenberg NRO office. 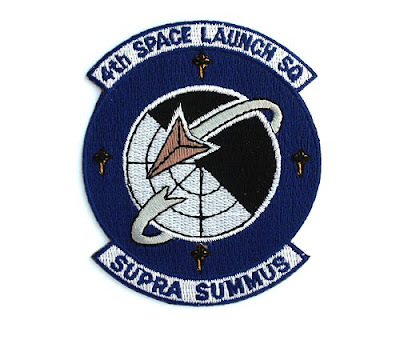 Together, we came upon the 614th Space Intelligence Squadron as a possible "suspect". In that case, the white stars could refer to the Squadron number: 6 + 1 on the right, 4 on the left = 614. This evening I had a nice pass of the new Japanese cargoship HTV-1 (09-048A, launched on September 10th) on it's maiden flight to the ISS. 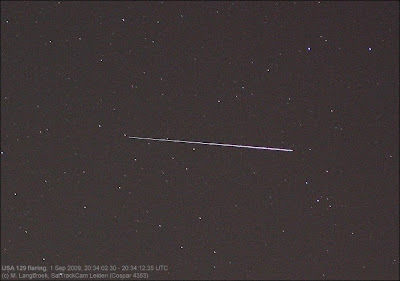 It was bright and fast, being about +1 or even a bit brighter, and flaring briefly to -1 at about 19:34:43 UTC. It was distinctly orange in colour. The detail image below, shows the distinct orange colour of the HTV-1. It is due to the spacecraft being wrapped in protective orange-coloured metal foil. 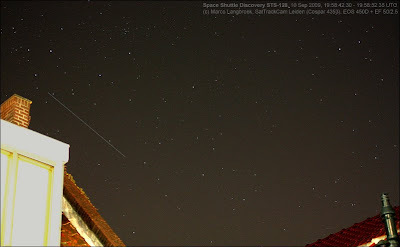 The evening of September 10 saw more than a nice Space Shuttle pass (see previous post) and the ISS. 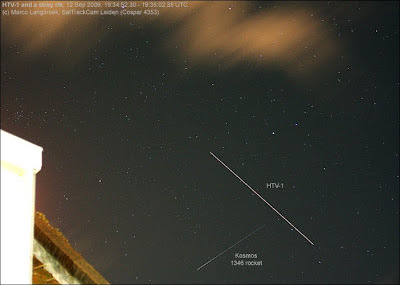 In fact, it was a prolific evening which yielded data on the Lacrosse 2 SAR (91-017A), the USA 186 KH-12 Keyhole (05-042A) and two objects in Molniya orbits: the ELINT and SBIRS satellite USA 184 (06-027A) and the SDS-3 communication satellite USA 198 (07-060A). 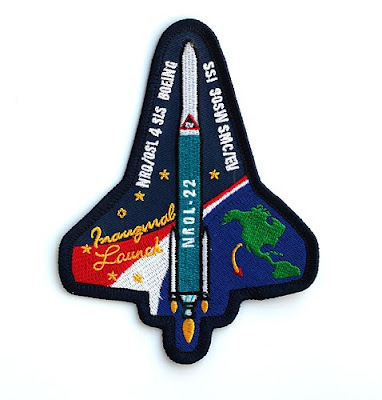 Yesterday it was a close call whether I would see the Space Shuttle Discovery STS-128 or not. A large field of clouds passed in late twilight, and only moved away some 10 minutes before the Shuttle pass. The clouds made me miss the newly launched Japanese HTV cargo ship to the ISS. But the clouds moved away in time, and there it was: about mag. 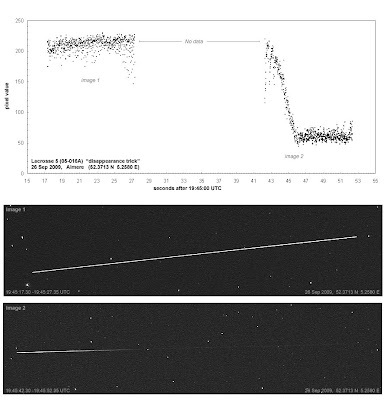 +2 to +2.5 and fast, and...39 seconds early on predictions based on orbital elements of earlier that day. 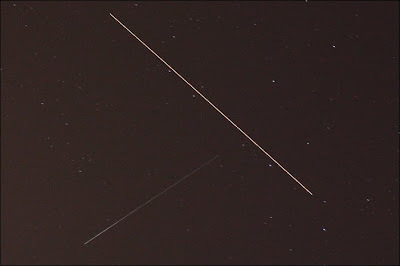 Three minutes later, the ISS sailed by in its majestic fashion. 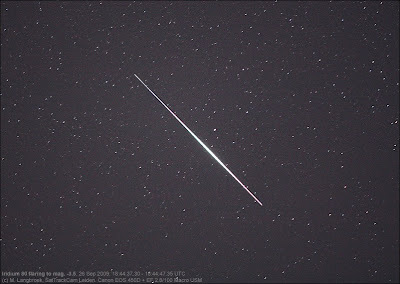 The image below shows the shuttle passing through Ophiuchus. Last two evenings were clear. On September 7th I watched and imaged the KH-12 Keyhole USA 129 (96-072A), together with my neighbour who saw her first Keyhole this way. On September 8th I imaged both USA 129 and another KH-12 keyhole, USA 186 (05-042A). USA 129 briefly flared to mag. +0.5 at 20:49:21.7 UTC. 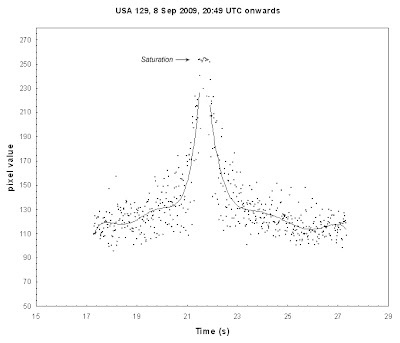 Below is the image, and the brightness profile (the image saturates near the flare peak). 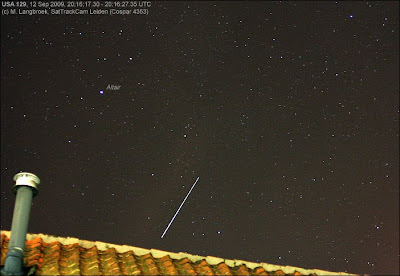 In the same image, slightly below and to the right, another faint trail can be seen: this is a rocket stage, 08-049B, from the launch of a Thai communication satellite in 2008, launched from Russia with a Dnepr rocket, a converted ICBM. 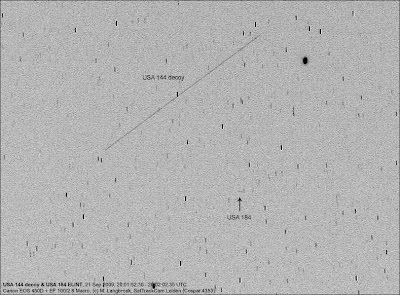 I also imaged two high altitude objects: again the USA 144/Misty-2 decoy (99-028C, see my post here and here) and USA 198 (07-060A), an SDS-3 communications satellite in a Molniya orbit. One of the tasks of this type of satellite, is believed to be the relay of data from the Keyholes to ground stations. The evenings of August 31 and September 1 were clear. 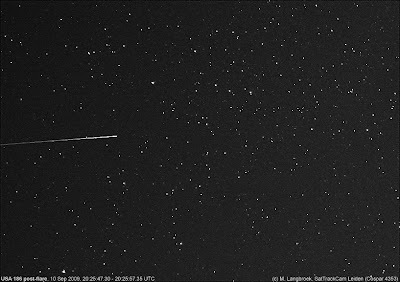 On August 31 I targetted two higher objects with the EF 100/2.8 Macro USM: USA 184 (06-027A), an ELINT in a Molniya orbit (see a few posts back), and the USA 144 Decoy again (99-028C). 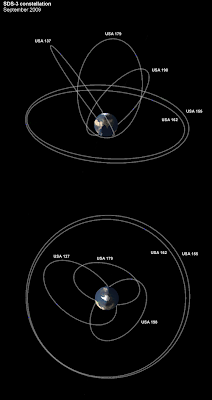 On September 1st, two LEO objects were the target: the KH-12 Keyholes USA 129 (96-072A) and USA 186 (05-042A). 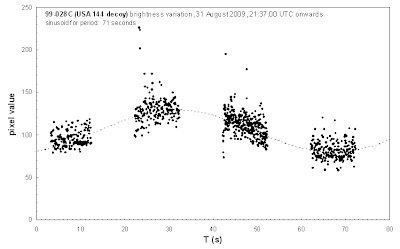 The series of images of the USA 144 Decoy yielded information again about the periodicity of it's brightness (indicating the tumbling period). Like the data of August 25 and 27, it fits a sinusoid with a period of 71 second.